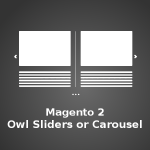 Standard Magento 2 functionality does not include the option of selecting a delivery date by customers. Luckily, the Delivery Date & Comment module by XTENTO extends default features of the Magento 2 platform, allowing merchants to inform their customers about delivery options. Providing customers with more possibilities for placing orders is a great way to improve the shopping experience and upgrade order management. The Delivery Date & Comment extension allows your customers to select preferred delivery date and time interval, and enter additional notes on order at checkout. The plugin does not add extra pages to a customer checkout journey, making the order placement process smooth and straightforward. This extension allows configuring delivery date and time intervals, holidays and delivery exceptions, as a business owner desires it. 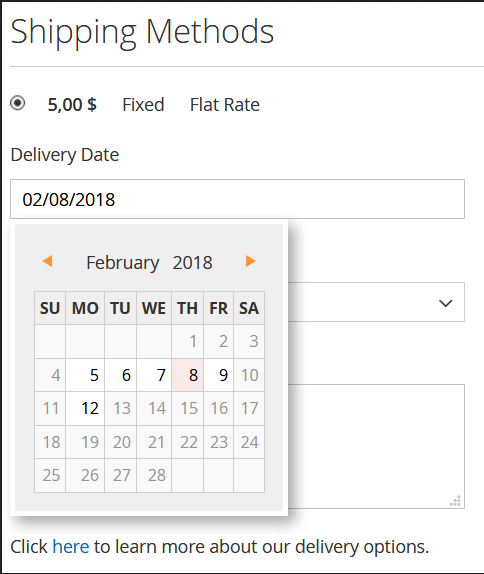 With the extension’s configuration settings, you can easily set up non-delivery days, minimum and maximum delivery intervals, as well as add additional delivery details to the sales order grid in the Magento Admin. Using the module, you will enjoy the flexibility it adds to every parameter you can configure in the backend. Store admins decide whether to display a delivery date field or time selector, or if a comment field should be added to the checkout page on the frontend, and much more. 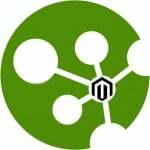 XTENTO, the plugin developer, is a Magento Technology Partner, meaning that they work with the core Magento developers. 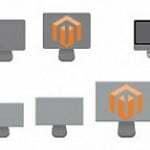 Magento certification proves that this extension brings a high-quality solution to its users and is officially compatible with the Magento Open Source and Magento Enterprise editions. Below we are providing an overview of the extension’s main features, a quick guide on the configuration of the plugin from the backend, and description of some functions in the frontend. With the extension, you allow your customers to specify the most suitable date and time of delivery on the checkout package. The extension does not add any additional pages to the checkout user experience. A customer will need to fill only two additional fields. If you enable adding a comment field in the backend, customers will be able to leave notes and provide you with the additional information related to their order. 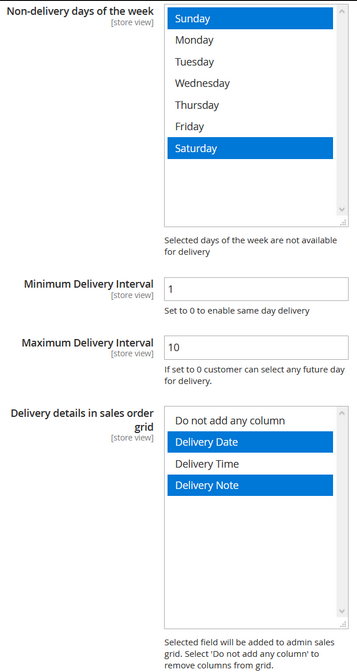 You can define which days or date ranges should be excluded from your delivery plan. In this way, you will keep your customers informed about your delivery availability, and reduce the stress of managing too many deliveries on weekends and holidays. You can configure the extension from the backend to block all unavailable delivery dates in the date selector calendar on the frontend. The extension allows specifying minimum and maximum intervals between an order placement date and actual delivery date. With the plugin, it is possible to remind customers of upcoming delivery by automatically sending a reminder email. You will just need to specify how many days before a purchase arrives you would like to send a reminder. Store admins can fully control how delivery date and time options look on the frontend. You can also choose to disable time interval or comment functionality if you do not need it. You can configure the module to add new columns to the order grids to inform your website admins about the selected delivery conditions. Delivery date, time, and comment data can also be included in the emails sent to customers and PDFs. The extension can be configured per store view, allowing users to set up individual delivery conditions for each store view. To configure Delivery Date & Comment settings, navigate to System → XTENTO Extensions → Delivery Date. All settings can be set up per store view, so, if you run multiple stores, you can configure extension settings separately for different stores. The Delivery Date & Comment module provides a complex configuration in the backend, allowing users to set up all possible parameters related to the delivery date and time. In the Delivery Date Configuration section, admins can set up all necessary settings for delivery date and time options customization in their web stores. 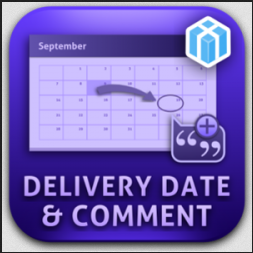 Here you can enable delivery date, delivery time, and delivery comment fields. When allowed, these fields will be added to the Shipping Methods section of the checkout page on your website. Since the module is fully configurable, you can also decide to disable time interval or comment functionality in the backend if you do not want this. 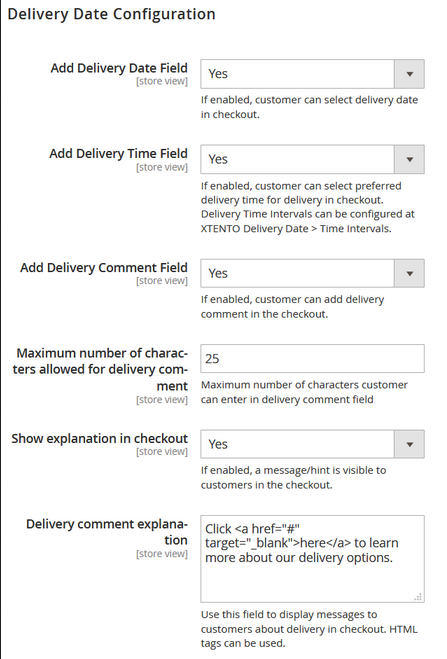 If enabling delivery comments at the checkout, you should specify the maximum number of characters customers can enter in the comment field. In this configuration section, you can also choose to add an admin message which will be displayed on the checkout page. You can create any text that will explain better the delivery functionality of your store to customers, as well as use HTML tags in the message text. In the “Non-delivery days of the week” field you can select the days you want to exclude from your delivery schedule. Then, you can specify minimal and maximal intervals between the order placement and the day of delivery. If you want to allow same-day delivery, enter “0” in the “Minimum Delivery Interval” field. 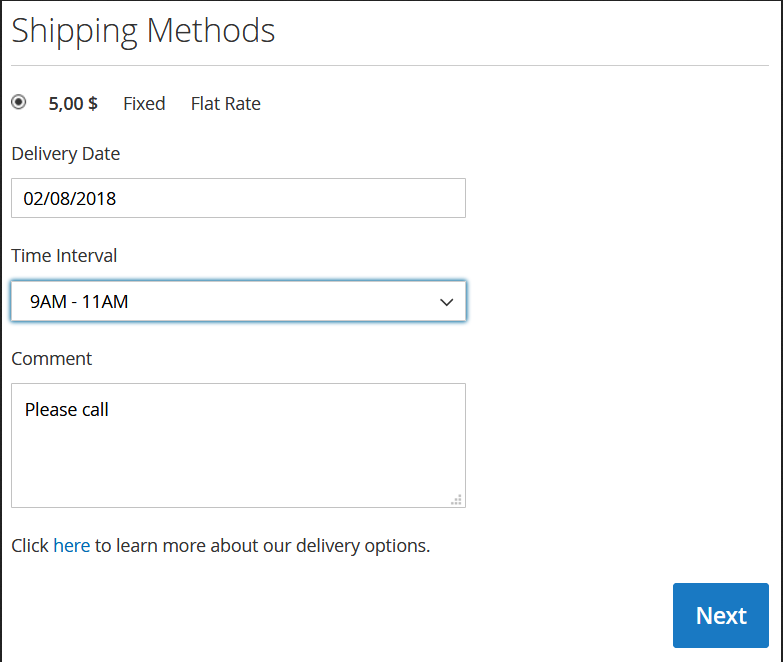 If you enter “0” in the “Maximum Delivery Interval” field, a customer will be able to pick any day for the delivery of their orders. You can decide, whether delivery date information should be displayed in the sales order grid or shipment grid, and which columns with delivery date data will be included in the grid if allowed. In the extension’s configuration settings, you can decide to include details on the delivery date, time, and comments in the order confirmation emails or customer PDFs. The extension also provides the feature of sending reminders to customers, informing them about the upcoming delivery. You can define the number of days before the package arrives when a reminder about upcoming shipment should be sent. 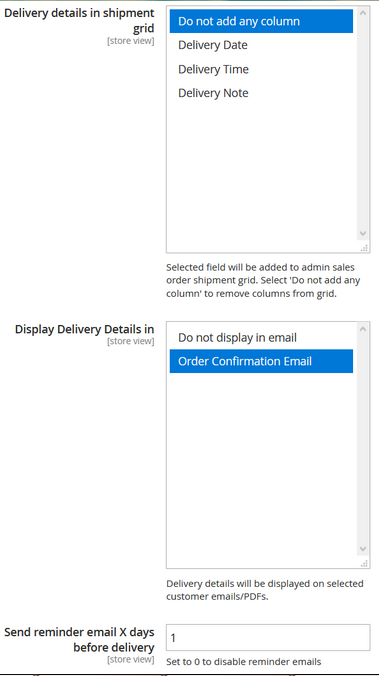 If enabled in the Delivery Date Configuration, Delivery Date, Delivery Time, and Delivery Comment columns will be added to the default sales order grid. Each column can be removed from the grid if required. The order view page will also get a new section displaying delivery details for the convenience of an admin. The plugin lets you set up holidays and delivery exceptions, meaning that you can predefine the days when you do not want to deliver your products. It is also possible to exclude date intervals from your delivery plan and create holiday periods when delivery is not available. In the Exception / Holiday grid, you can view and manage all days when delivery is not provided to customers. By clicking on the “Add New Exception Date / Holiday” button in the top right corner of the page, you can add a new exception. To add a new exception, you should select a store view, start and end dates of an exception period, and add a description. It is possible to make the exception active permanently each year if you choose Yes in the “Continue Every year” setting. With the extension, you can configure time intervals for delivery in the same way. You can reach the Time Intervals grid if you go to XTENTO Delivery Date → Time intervals. Here you can set up flexible time intervals that are available for delivery. By clicking the “Add New Time Interval” button in the top right corner of the page, you can create a new delivery time interval. To do so, select a store view, specify from when to when delivery service is possible, and set the sort order. When you enable delivery date, time, and comment fields in the backend, the extension will add a new section to the standard checkout page. Customers will be able to select preferred delivery date and time interval and leave notes related to the delivery. 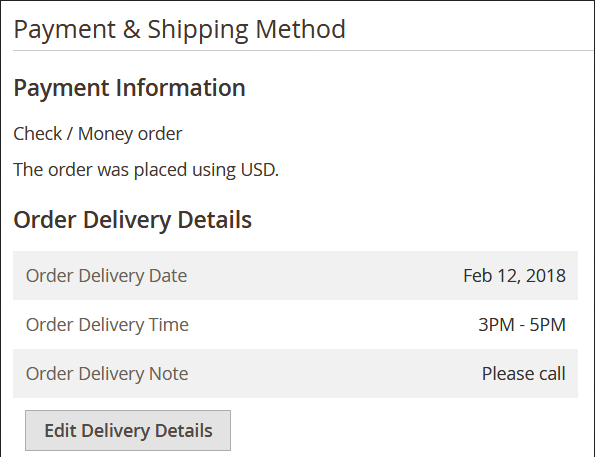 The delivery date functionality will be added to the Shipping Methods section of the checkout page on the frontend. Customers can select a delivery date from the available range of dates in the date selector. If you specify delivery date exceptions in the backend, some dates will be blocked from selecting at checkout. Before placing an order, customers can review delivery details, including delivery date, time, and comment, in the Review & Payments section of the checkout page. The Delivery Date & Comment module improves the default functionality of the Magento 2 platform by adding the feature of delivery date and time options. This feature can improve user experience drastically, providing your customers with extended options on delivery when they order products on your web store. The Delivery Date & Comment extension cost is just $99, including free email support. The extension package also includes high-quality open source code and extension updates with no extra charges during the first six months after the purchase. The extension’s code is not encrypted and gives you full control over customization according to your ecommerce business needs.